"You have found the body of Sotha Sil, his lifeless husk dangling from a contraption of his own making. Someone has obviously been here before you." Almalexia will then arrive and reveal that she was behind the attack, killing Sotha Sil and unleashing his fabricants upon Mournhold. Almalexia will then proclaim that she alone will be the savior of the Dunmer people, and intends on killing on and Vivec to achieve that goal, just prior to attacking you. Sotha Sil is not technically an NPC or creature, but rather an activatable asset (similar to a door or button) and therefore cannot be resurrected through console commands or other means. 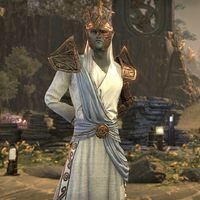 Sotha Sil re-appears in ESO and TES Legends. His appearance is rather different as he wears a robe and does not yet have robotic legs, though his mask bears some similarities to the one he wears in Tribunal. The events preluding his death are also expanded upon. In ESO, dialogue with Sotha Sil reveals that he has the capability to analyze every possible scenario of a situation and predict the future. One of the main preset threat detections to the Clockwork City is called "Prospect Almalexia", with Sil himself saying "Almalexia does what she does because she cannot do otherwise. It will not end well. But then, even the best endings rarely bring joy." (a slight foreshadowing of his fate). In the Return to Clockwork City story of Legends, it is revealed that Sotha Sil created a new source of energy called the Mechanical Heart to power the city after his inevitable death, and was protecting its chamber moments before Almalexia killed him.